There are so many things to see and to in South Africa that we have had to group them together to form some kind of order. Even seemingly deserted areas like the Karoo and the Northern Cape have beautiful landscapes, with a fascinating history waiting to be told. Luckily we now have routes in South Africa that group the most interesting destinations in each particular region together. On the Whale Route you can visit the best Whale Watching spots in the Western Cape while on the Battlefields Route you can see the most famous battlefields of the Anglo Boer War in KwaZulu Natal. This is the first of nine posts for our ‘Routes you Have to Know About’ series of blogs. 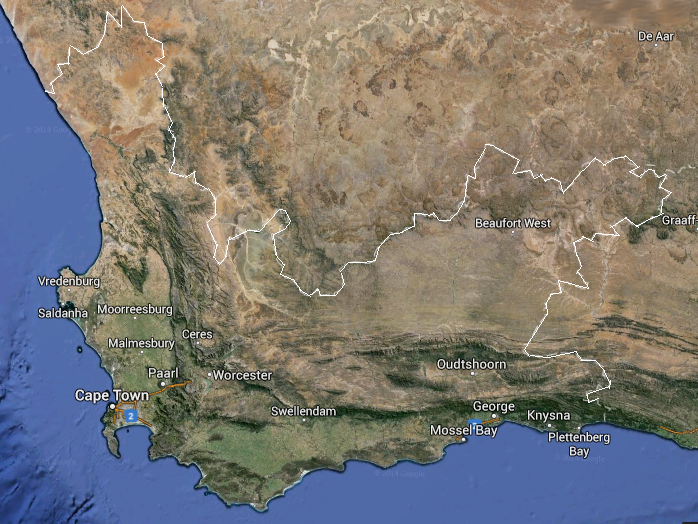 We have decided to make a list of interesting routes for every province in South Africa, so you don’t have to. 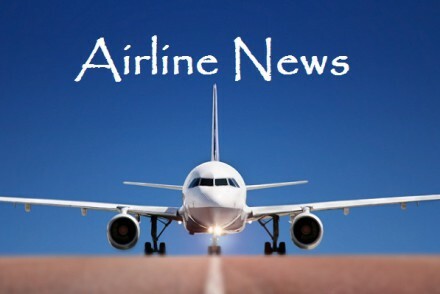 We are Making Travel Easy one blog post at a time! The Crayfish Route runs down the West Coast from one small fishing village to another. The west coast of South Africa is an area where time stood still while the rest of the world changed around it. Here you can still find old world hospitality and of course most importantly Crayfish. There is one must visit restaurant on the route which stretches from Ebenhaeser to Elands Bay. 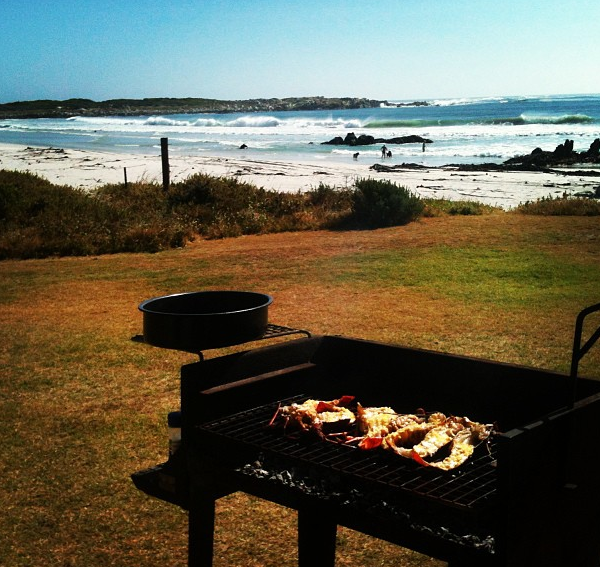 Just outside of Lambertsbaai there is a small restaurant that only opens over weekends called Muisbosskerm. The restaurant serves up some of the freshest seafood in the country right on the banks of the Atlantic Ocean. The R62 Brandy Route follows the well-known R62 road, the more scenic alternative to the N2, and includes visiting points at Barrydale, Calitzdorp, Worcester, Montagu, De Rust and Oudtshoorn. The route snakes through one of South Africa’s most diverse areas, running past mountains, rivers, orchards, vineyards and over scenic passes. The brandy distilleries along the route open their doors to visitors for brandy tastings and cellar tours. The charm of the route is that it is still relatively unknown so you won’t find big buses loaded with tourists along the way, for now. Méthode Cap Classique is the South African term used to describe a sparkling wine made in South Africa in the traditional French method of champagne making. The Franschhoek Wine Valley recently relaunched the Méthode Cap Classique route, which has a total of 17 Cap Classique producers. The route welcomed Plaisir de Merle, Grande Provence and La Motte to the distinguished list of producers. Visitors can taste the unique vintages from the valley that are made in the traditional French method of making champagne. The route starts outside the small town of Klapmuts on the Backsberg Estate between Stellenbosch and Franschhoek, and stretches to Stony Brook Vineyards at the very end of the Franschhoek Valley. The Kamieskroon Route runs over the forgotten Kamiesberg region. The bio diversity of the region has been studied by botanists from the University of Cape Town for over a decade. The Kamieskroon Route passes through one of the most untouched areas in all of South Africa. In the town of Paulshoek running water was only introduced a few years ago. Many people in the area still use Kokerbome to build natural “fridges”. The route passes through desert-like areas, the thickly sanded Bushmanland and the Namaqua Broken Veld. During the spring the area is littered with blooming Namaqua flowers, while in the winter months the higher parts of the route often gets covered in snow. The Kamieskroon Route is predominantly in the Northern Cape, but it’s worth going across the “boarder” for! Wine has been made in the Constantia Valley since 1685, which makes it the oldest wine producing area in Southern Africa. The flagship winery on the route is the oldest wine farm in South Africa Groot Constantia. The farm was owned by one of the Cape’s most famous Colonial figures, Simon van Der Stel, who was the Governor of the Cape Colony from 1679 to 1691. His homestead and many of the original buildings on the farm have been preserved and turned into museums. 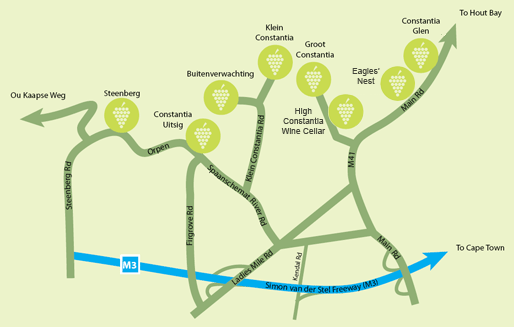 The Constantia Valley has only nine wine farms situated on it, all of which produce world class wines. 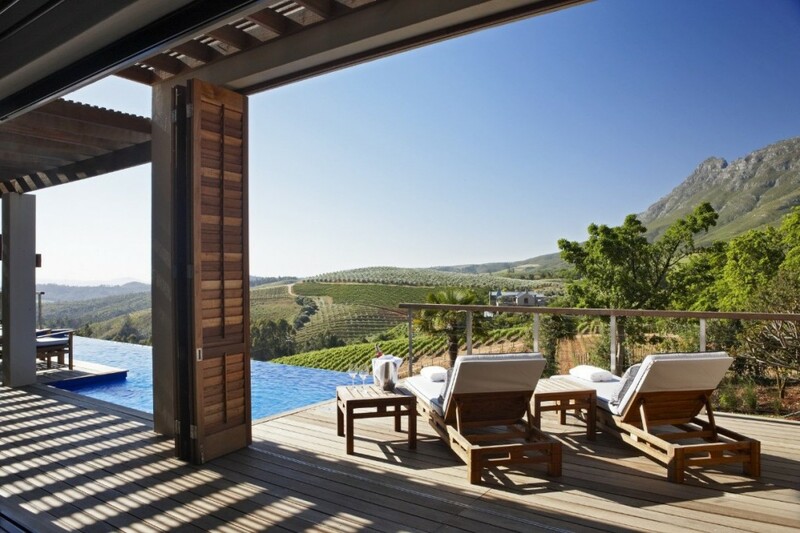 Golfers can play a round of golf and taste the delicious wine produced in the area at the Steenberg Golf and Wine Estate. The Constantia Wine Route is only 20 minutes outside of Cape Town, which makes it the perfect day trip out of Cape Town. The Stellenbosch Wine Route and the Garden Route are arguably South Africa’s most popular routes. 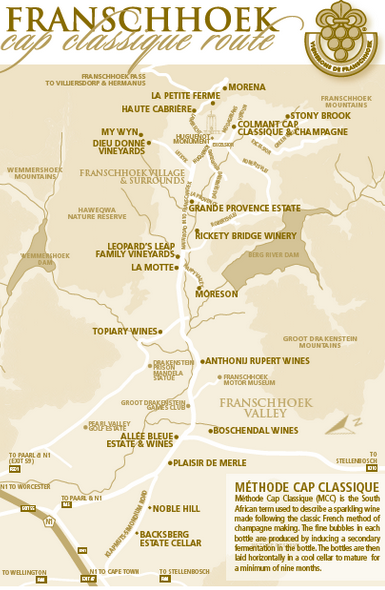 The Stellenbosch Wine route is known as ‘Ground Zero’ of the South African wine industry. There are over 100 wine farms situated on the route. Almost all of the farms offer wine tastings and many of them have top class lunch and dinner restaurants, with some breath taking views. Block out at least 2 to 3 days to experience all there is to offer on the route and in Stellenbosch itself. The Diamond Coast Route takes visitors through the history of the diamond trade in South Africa, which stretches back for over a century. The museums and mine tours which are plentiful along the route, shows you where prospectors came in search of their fortunes which lay under the desert sand. The route which passes through Port Nolloth and Alexander Bay, among others, is one of the lesser known routes in South Africa. But it by no means lacks in history or beauty when compared to the more popular or famous routes in South Africa. As stated above the Garden Route and the Stellenbosch Wine route are the two most popular routes in South Africa. 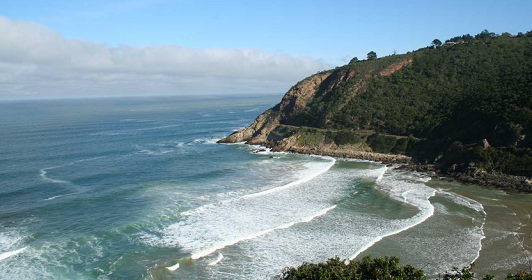 The Garden Route starts in Mossel Bay in the Western Cape and ends at the mouth of the Storms River in the Eastern Cape. The route runs through some of South Africa’s most popular and most beautiful coastal towns. Groot Brak, Knysna, Plettenberg Bay, Tsitsikamma, Keurboomstrand and Natures Valley are the beautiful towns situated along the route. There are also world class golf courses designed by the likes of major winners Ernie Els and Gary Player along the route for golfers to enjoy. All in all the garden route arguably has more to offer travellers than any other route in South Africa. From world class wines, great food and stunning golf estates to untouched nature and a pristine coastline, the Garden Route has it all. 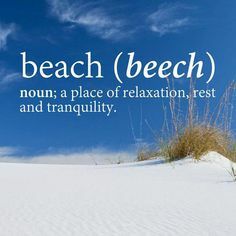 Check out our South African Travel Packages here.